In large pot, boil potatoes 15 minutes or until tender. Remove from pot, drain and set aside. Place 1 stick of butter and onions in pan and sauté them until tender. Add 3 tablespoons of flour to butter and onions and stir until all is incorporated. Brown this mixture about 2 minutes – be careful not to burn. Add milk, cheese dip, broth, half&half cream and pepper. Stir until blended together. Add your potatoes back to the pot. Stir in bacon bits. 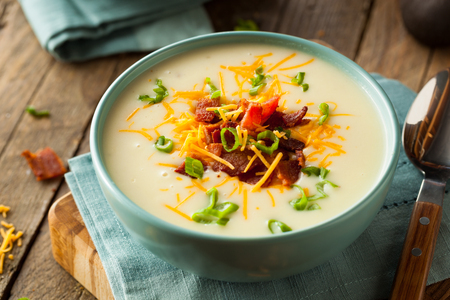 Ladle the soup into bowls, dollop sour cream, sprinkle with remaining bacon bits, cheese and chives.